Use staBetic flock grass to give you realistic and beautiful fields of grass. 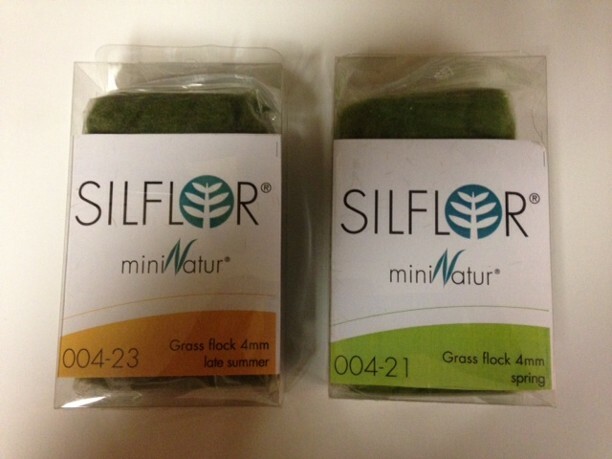 When applying static flock grass always use the best flock for the best results and we have tried many brands and have found the Silflor product to give the absolute best results!! We offer several different lengths, from 2mm to 12 mm in four seasonal colors, each box contains about 1.25 cup of flock that will cover 2-4 sq ft depending on the thickness that you are wanting to achieve. When applying flock grass try two lengths, begin with a shorter length and when it has dried add some longer grass to add depth and realism. You can do full fields or small tufts in your roads and along rail beds, again its up to your imagination to create a realistic scene! Check out our events page to see the next train show we will be doing demo's at or give us a call and we will be happy to explain the best way to apply the static flock grass. .